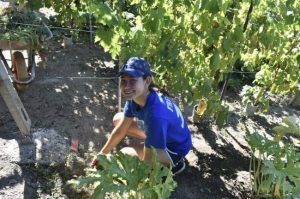 This Blog will serve as an insider’s perspective on what it means to be a member of the Camden Catholic community. Both students and faculty will participate by sharing posts on a regular basis that discuss academics, extra-curricular activities and spiritual insight gained from their Irish Experience. Read on, and if you have questions or comments feel free to post below. 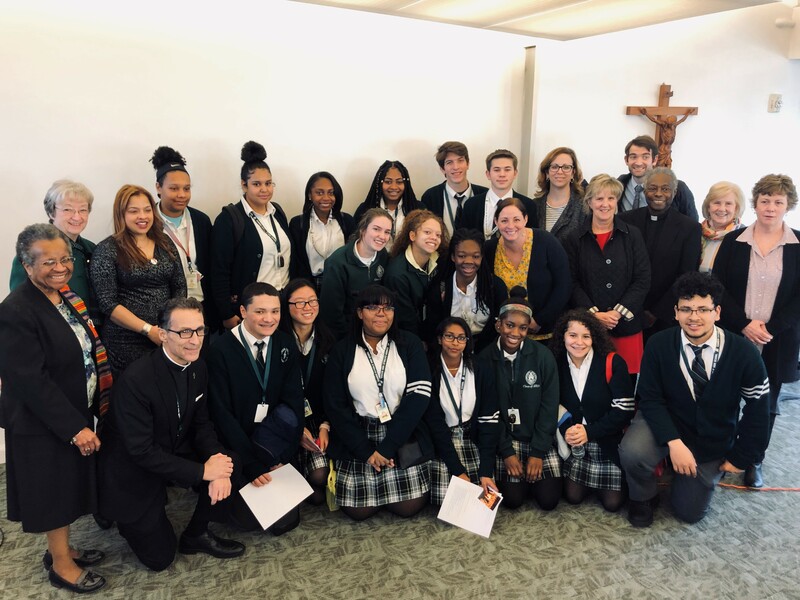 On February 5th, T.H.E Council (Together Honoring Everyone) accompanied by Father Joe, Mrs. Whipkey, and Mrs. Crisci, took an enlightening trip to a workshop held by the Office of Life & Justice Ministries. Titled “What is Racism?”, we learned the true definition of racism and how it affects our everyday lives. We began with an exercise of sharing our names and explaining what we wish to take from this workshop. Among the many answers, the consensus was that we intended to grow from this experience, learn about racism, and apply our knowledge to our everyday lives to ultimately make the world a better place. Sister Cora Marie Billings and Sister Rose Martin presented a Powerpoint with immense detail of the different types of racism and how it affects us subconsciously. The term Systemic Racism was then explained to us. Systemic Racism is racism that is embedded in social institutions and structures within our society. We split into small groups to talk about how we observe racism in different aspects of our lives. The education system, the housing system, the healthcare system, and the media were some of the few systems that were named. A substantial part of the workshop was used to self reflect on the hidden prejudices we may have within ourselves. The terms IRS and IRO were defined and were applied to subconscious feelings and attitudes we may have. IRS means Internalized Racial Superiority and IRO is defined as Internalized Racial Oppression. Sister Cora and Sister Rose described their experience with these internalized behaviors and gave life to the significance of implicit attitudes like these. IRO is characterized as a trait common in people of color and conversely, IRS is assigned to people of white. This period of self reflection helped us to see our own faults and prejudices that we may carry within ourselves or lack thereof. For the latter portion of the workshop, the concept of the “single-story” and its danger was made known to us. “The Single-Story” is simply a generalization or a stereotype applied to a group of people so often that many believe it as truth. We viewed the speech by Chimamanda Ngozi Adichie, “The Danger of a Single Story”, in which she describes her experience as a Nigerian battling negative stereotypes and ideas about her as an African and Africa itself. After watching this video, we were asked to examine the danger of a single story and we were able to listen and understand multiple perspectives of people who had been affected by the “single story” mindset. In totality, we examined our ethnic differences and were able to see the beauty in them. We were able to have an informative and honest discussion with no judgement about the sensitive topic of racism. In addition to this, we now have the tools to expose the damage racism causes and deal with it. As the workshop neared its ending we began to pray. We praised God for the diversity bestowed upon us and celebrated our differences. We concluded with a prayer for the end of racism and discrimination and left with new knowledge and insight to make this happen. knowing that the spark of life within each person on earth is the spark of your divine life. Differences among cultures and races are multicolored manifestations of Your Light. May our hearts and minds be open to celebrate similarities and differences among our sisters and brothers. We place our hopes for racial harmony in our committed action and in Your Presence in our Neighbor. May all peoples live in Peace. When I first heard the words “five paragraph essay” my immediate thought was, “What the heck is a five paragraph essay?” Simply put, when I first came to Camden Catholic, my writing skills were not very developed. I started my journey in one of the hardest classes I would take my freshman year: Mr. D’Antonio’s English Literature and Composition. It was a class that would quickly teach me how to write a decent paper that got my point across and would possibly make me seem smarter than I really was. It was a struggle a first, but I came out able to make a good argument and use writing skills that gave my essays a personal flair. Moving into sophomore year, I had Mrs. Maccherone, a lovely lady who has an affinity for more sophisticated prose and approached writing from a different point of view. Once again, I needed to shape myself into a student who used witty transitions and eloquent phrases to enhance my style. It was a huge leap, but a nice one. The variety kept things interesting. Now, in junior year, I have Mrs. Werner-Kaiser, where my writing is no longer about analyzing the symbols and metaphors littered in a piece, but instead focused on diction and syntax. I’m still trying to figure out the different terms that seem to be coming out of the floorboards,but it keeps me busy. The expansive world of rhetoric is all there for me to explore. It’s not hard to see that my writing has been anything but stagnant over the past three years, and I’ve been wearing different hats depending on what my teachers prefer or what the content is about. Now, this isn’t exactly advice, my telling you that your writing will always change and you’ll constantly be on the move, so I’ll leave you with this: always seek help. There are so many opportunities to get writing help at CCHS that there is no way students can say they don’t know how to write an essay. On Tuesdays and Thursdays after school, The Writing Center in Room 235 is a place where desperate students can go and receive notes and tips on how to improve their writing from Mrs. Maccherone herself. She will help you, but most of the time you’re meant to stretch your creative muscles and play with your writing yourself. If you can’t make it after school, then teachers welcome student visits during Activity Period, when you can ask him or her to clarify things that you can’t figure out, or help pull you out of the dreaded writer’s block. As I said before, our English teachers are well aware that writing changes and varies from teacher to teacher, and there is a period of time where they will guide you in the process of writing a cohesive and sound essay. But, if I’m being completely honest, you will learn how to write properly all by yourself. While styles may change, the main purpose of an essay does not, and you may need some time to adjust to the preferences of your teacher, but in the end you’ll find your feet again, and you’ll take off running, ready to take on the next literary challenge. I saw Les Miserable here at Camden Catholic six times in the spring of 2015 and knew from the very first note sung that the Camden Catholic stage was where I wanted to be. I could see the unity among the cast from my seat in the back row and couldn’t wait to have the opportunity to join them up there the following year. The show my freshman year was Rodgers and Hammerstein’s Cinderella, which was, simply put, one of the best experiences of my life. I was the lone freshman featured dancer, and couldn’t wait to combine my two worlds and get to sing while I danced, using some of the new skills I learned as a member of both the Camden Catholic choir and dance team. The show itself was magical in every sense of the word, from the costumes to the fog, from the lighting to the transcendence of the lucid melodies that flowed from the orchestra pit. I didn’t realize it then, but that type of excitement is nearly impossible to replicate. Last year, I was cast as Hope Harcourt in our production of the depression-era classic Anything Goes. I was terrified to start rehearsal, as it was the first production in which I have ever had a line. To my surprise, the upperclassmen welcomed me and took me under their wings, as I’m sure they could sense my anxiety. My nerves seemed to vanish instantly. Within days of rehearsal I had a whole cast of new best friends, and the Camden Catholic stage felt as familiar as my own home. 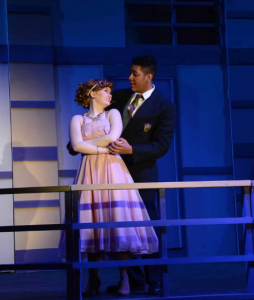 Anything Goes proved to be a bit of a learning curve for me, but it was not unwelcome in the slightest, as it taught me the value of hard work, collaboration, and the importance of a shared laugh. The arts at Camden Catholic have given me opportunities like no other. Thanks to the arts, I have learned so much about myself, others, music, and what it’s like to create magic with a team. The long hours of rehearsal don’t feel so long when you’re doing what you love with the people you love, sharing laughs during holds and snacks backstage, passing theatrical wisdom down to the newest members of the Camden Catholic Family. To be perfectly honest, the entire process is hardly about the show itself. Well, it is, sure, but the performances are hardly what I remember most. We spend nine hours performing, and we spend hundreds of hours rehearsing, but we will spend the rest of our lives cherishing the memories and friendships we made during our time on the Camden Catholic stage. Often, the students of the Camden Catholic community refer to CCHS as their “second home”; however, for student-athletes this phrase takes on a whole different meaning. During their particular sport’s season, student-athletes basically live at school. For me, field hockey and lacrosse season often calls for 12-hour days within the halls and on Shamrock Field. From everyday practices, to game days, to the endless amounts of homework that we somehow must find the time to do, being a student-athlete is not as glorious as it’s made out to be. It takes dedication, hard work, and some definite time management skills to succeed on and off the field. You are depended on by parents, coaches, teachers, teammates, and even fans, and the last thing you want to do is let any of them down. So, you pile your plate high with demands and you only hope that you will somehow be able to plow through everything within an insanely short time frame. Ultimately, being a student-athlete is one of the most demanding and time-consuming jobs that a high school student can obtain. Despite this intense level of dedication to academics and athletics, I couldn’t imagine my past 4 years of high school any other way. The bonds formed between you and your teammates, the electric feeling felt down in the pit of your stomach when you wake up on game day, the pain in your legs that tells you that you can’t go on, and then that feeling when you do. These are all things that can never be replaced. These feelings are what I will reflect on when I think back to my time here at Camden Catholic. I won’t remember the nights I spent studying until 4 AM because I had a night game. I won’t remember the score of any of the games that my team and I trained so hard for. I won’t even remember the pain felt all over my body after a hard practice (except I probably will remember the horrors that follow the demand, “Get on the end line”—my fellow student-athletes can relate). Instead, I will remember the bus rides to away games. I’ll remember the thrill I share with my teammates after each killer goal or huge win. I’ll remember the team hugs after each heart-wrenching loss. I’ll remember the team dinners and the late-night practices. 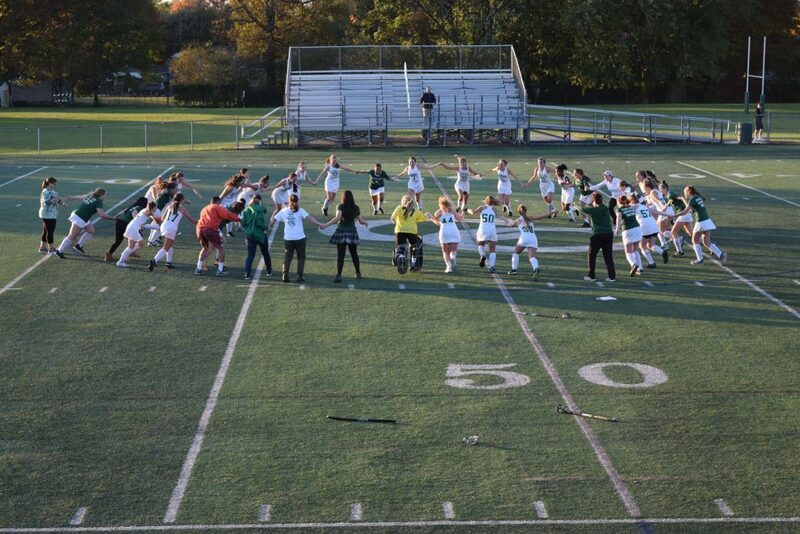 But most importantly, I will remember the laughs, the tears, and the friendships that I made on Shamrock Field. 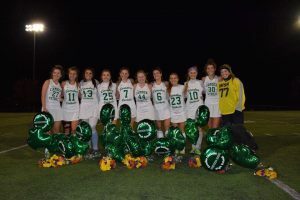 This past Wednesday, I had my senior night for field hockey. It was a night of crying, smiling, cheering, and laughing (plus winning, but that’s besides the point). Most of all, it was a night spent with my teammates that I will never forget. As my final moments with my team are slipping away, I’m left with some mixed emotions—while I am devastated that my clock is ticking down, I am beyond grateful for all the memories I have made. So, if I can leave you with one piece of advice, it is to become a student-athlete; while the work may be strenuous, the impact will last a lifetime. Why did I choose Camden Catholic? My name is Michael Alvarez, and I just started my freshman year at CCHS. Growing up with vitiligo, which is a disease that affects the way I look, I’ve always been self-conscious of my appearance. This usually made me fairly shy when I had to visit high schools, but when I visited Camden Catholic for the first time, I was welcomed with open arms despite my appearance. So to answer the question “Why did I choose Camden Catholic?”, it’s because they were so unbelievably courteous and they welcomed me into their family. I’m incredibly excited to see what the next four years will bring me and I’m incredibly grateful that I chose Camden Catholic. I am proud to say I have no qualms about choosing Camden Catholic and I know in my heart that this is where I’m meant to be. Before visiting CCHS, I thought choosing a high school would probably be the hardest decision in my life so far. I thought I needed to go where my friends went or where people tried to convince me to go. At this period in my life I was rather torn deciding which high school I should go to. It was really a decision between listening to my friends or listening to what I wanted to do. This all changed when I went to visit Camden Catholic. The moment I walked through those doors, dozens of people who had no idea who I was greeted me with amiable smiles and firm handshakes. I was surrounded by people who were always willing to be there for each other, almost as if these people were family. I have never been greeted with such cordiality. This sense of community is what I think sets Camden Catholic apart from any high school in the diocese. The moment you walk through those doors, you are treated as family, everyone knows your name, and they always want you to be there. 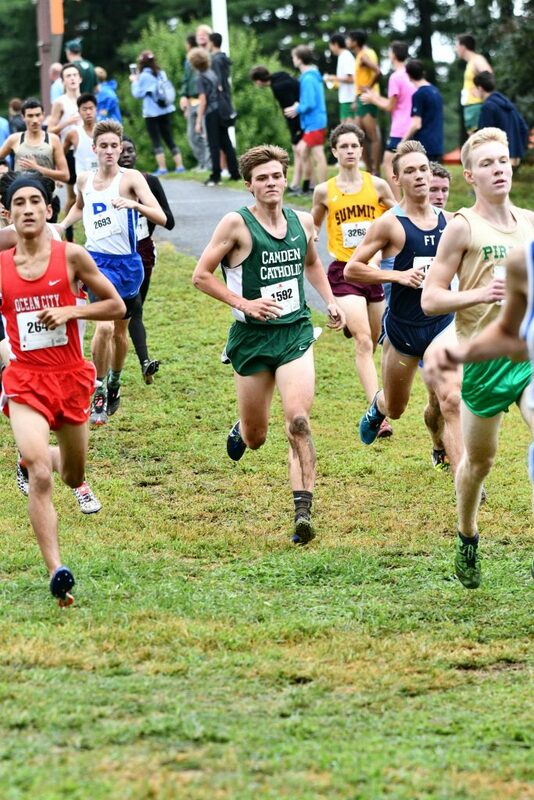 The best possible way to experience what I have is to come visit Camden Catholic in person. 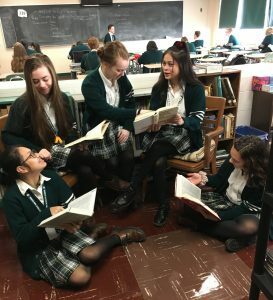 I believe it is absolutely imperative to visit Open House to experience Camden Catholic the way I did, and the way so many students over the years have. Immerse yourself in this community. We are always willing to welcome a new member into our family. I hope that Camden Catholic can be as pivotal in your life as it has been to mine. What’s it mean to be an Irish student-athlete? Hey Camden Catholic community, Ray here. Do you go to Camden Catholic as a student? Do you play a sport there? If you answered yes to both of those questions, then you are a “student-athlete.” Many Camden Catholic students are student-athletes, about 62% of the student body. Student-athletes are faced with many challenges and managing them can be difficult, but rewarding, and a great preparation for what’s to come in college. Being a student-athlete requires time-management and focus. Games, meets, practices and team activities cannot become paramount to academics, so student-athletes have to learn how to prioritize. Beyond the challenge of time management, student-athletes are also going to be more physically and mentally drained. For example, during the peak of cross country season, I may be running up to 65 miles a week. I have to go to bed earlier, wake up later, and even after all that, I’m still tired. Getting your sleep schedule down is one of the most important parts of an athlete’s training schedule and doing so will also help you perform better in school. Another thing to keep in mind during intense training is how much you are eating. To stay healthy you must eat and drink more than when you are not training. If you don’t do these things, your ability to perform well in class will suffer, your performance on the field will decline, you will not feel healthy, and may also be more prone to sickness. Now let’s get to the fun stuff! Camden Catholic athletes are some of the best at managing the things mentioned above. With some of the most highly-regarded sports teams in New Jersey, as well as some of the the best academics, Irish student-athletes are known for their ability to time manage. We have had many sports teams that performed exceedingly well in recent years. Just last winter, we had a state champion wrestler, a state champion 4×800 meter relay team in winter track, and the boys basketball team made it to the state final! In spring track, the 4×800 meter relay team again showed the sports world how competent they are by qualifying for the Penn Relays, and boys lacrosse dug deep and came together as a team during a season of hardship. All of these athletes must – at the same time – maintain a GPA that allows them to participate in their respective sports. So for all those student-athletes out there, remember what it takes to perform well. But, also remember that great things come from hard work, it doesn’t take a lot of looking to see it here at Camden Catholic. 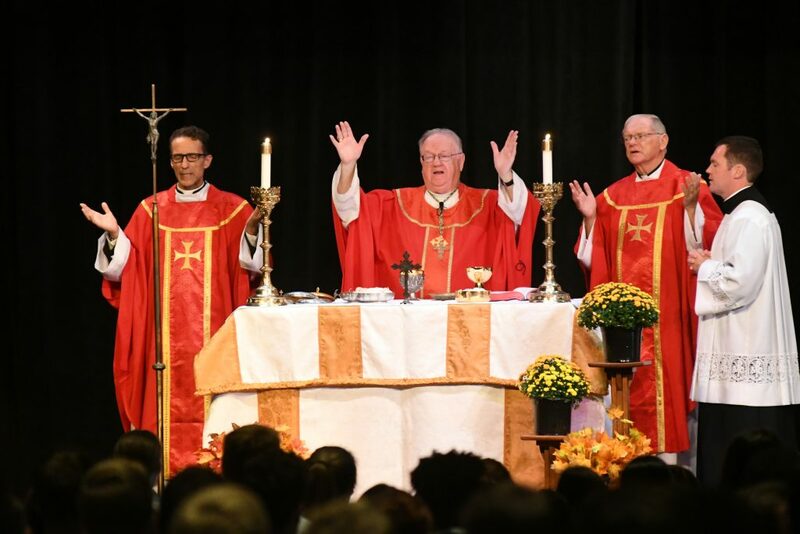 There is something special about Bishop’s Mass every single year. There is a mood of excitement, perhaps even reverence, that such a beloved figure would grace the school with his presence. Listening to the Bishop’s homily, I was struck by how eloquent of a speaker he was. At first he described the Thailand cave rescue, and I was unsure how it related to God, but I was captivated nonetheless. 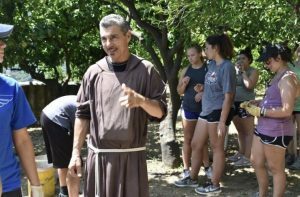 Then, the Bishop described how the coach of the trapped soccer team used the power of prayer to lead his team through the difficult 17 days they were trapped in the cave. The applications of prayer in my every day life became more apparent after this homily. Everyone in the school was grateful the Bishop took time out of his very busy schedule to come speak to us. The entire student body was participating in the Mass, and I became filled with a strong pride in my school. With someone as important as the Bishop visiting, the entire school united and came together as one. I was so proud to be a student at Camden Catholic, and I know the Bishop’s message rang true for every member of the school. 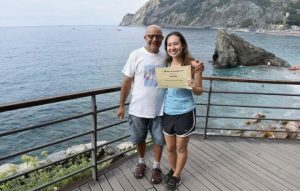 In the summer of 2018, senior Mia Nixon traveled to Cinque Terrre, a UNESCO world heritage site in Italy to participate in a variety of service projects in the region. After her service she explored other parts of Italy, which included Vatican City. 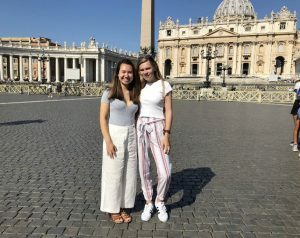 “It was truly a blessing to be able to visit the global heart of the Catholic faith, and represent the Irish,” says Mia. She describes her trip below. The Cinque Terre is one of Italy’s hidden gems located along the Italian Riviera coastline known for its pastel-colored houses on terraced cliffs. Although the region is full of beauty, the Cinque Terre faces environmental challenges such as deadly mudslides and rock falls. 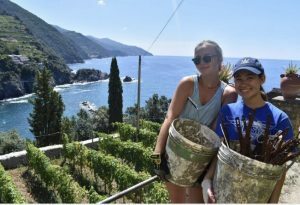 Through a travel company for students, I was able to help the Cinque Terre community last July providing a variety of service over the course of 3 days with 20 students from across the United States. 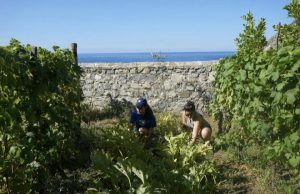 Each morning our day began maintaining sections of the Cinque Terre National Park clearing out any debris covering its hiking trail that overlooks breathtaking views of the Mediterranean. 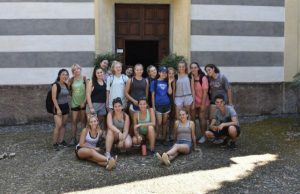 Our group also repainted an elementary school, and rebuilt historic walls of a monastery as well as work in its large garden. This trip allowed me to not only admire the Cinque Terre, but to also leave an impact through service. 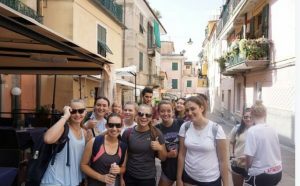 By talking to locals who I met in restaurants, little shops, or passing by during our service, I gained a deep insight into Italy’s culture, and even learned some of the language- Prego! 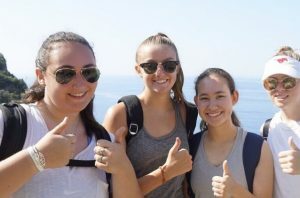 Helping the Cinque Terre was very meaningful, and I loved every moment of this experience, but my favorite part was the other students on my trip. I met a great group of girls from Texas, Massachusetts, and New York, who had a passion for service just like me, and we became close friends over the trip. It’s been two months since our trip, but we still communicate with each other everyday. To be a better writing teacher one must strive to be a better writer, and to become a better writer one must write. That is a simple dictum I follow. This summer I followed it all the way to a farm in the Tuscan countryside near the town of San Gimignano. For five days I had the privilege to write with a view of sage and silver olive groves and vineyards glazed by the lemony sunshine. It was like living in a painting. At the same time I was challenged to listen carefully—to my instructor and to my surroundings—and to craft a response on the spot, a task that teachers often give to students but rarely demand of themselves. Meeting that challenge renewed my appreciation for this enterprise we call learning to write… and gave me some nifty new ideas for the Creative Writing Club! 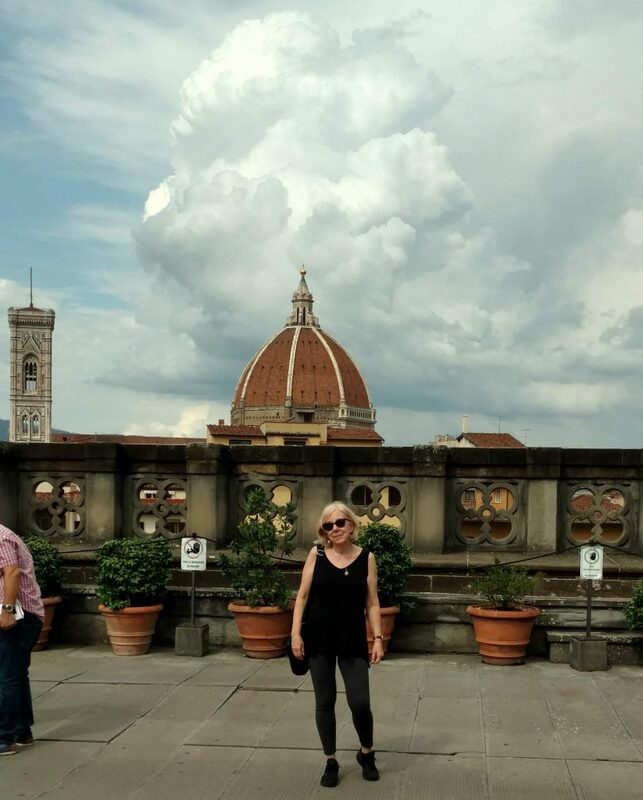 Of course I couldn’t be so close to the city of Florence and not stop there for a few days to take in all the art and architecture I could lay my eyes on. Michelangelo and Raphael, Bernini and Brunelleschi. The names alone are evocative. Color plates of their works in those big old library books or as digital reproductions on a screen are beautiful to behold, but to walk right up to the Baptistery doors or to circle David in The Academia is a different experience entirely. Being on the sites of such greatness feeds the intellect and piques the imagination. One day I had lunch on the very street where Dante lived before his exile. It was rather unreal. I usually avoid the now-overused word awesome, but for Italy it is la parola perfetta. Back at school I settle in with books, the next best thing. Until that time when we can take to the road, we read and sustain ourselves with the vicarious experience. Dostoevsky and Dickens, Sophocles and Shakespeare, and so many others are our tour guides. As we start another year together, prepared to gather up knowledge, our amulet against ignorance, I am reminded of the essayist Francis Bacon, who wrote a great deal not only about travel but also about other modes of learning. His advice is tried and true: “Reading maketh a full man; conference a ready man; and writing an exact man.” So we fill ourselves with reading, confer and converse to make us ready for deeper understanding, and write to clarify our thinking. Then we pack our bags again and go.